Walleto Theme also comes packed with the most common payment gateways, like: PayPal, MoneyBookers/Skrill, and Payza. Also we can support PayFast for South African market, or iDeal for Dutch Market and many others, like Authorize.Net, QuickPay, Google Wallet. All in all this theme is one of the best, if not, the best WordPress Theme to host a marketplace website. If you are still looking for more answers or you are not sure of your purchase, you can contact us, and we will answer to any queries, including custom work, or custom payment gateways integration. Also before contacting, you could check the Presales Questions and see if you can find your answer there. Our theme is compatible to the latest version of WordPress. And always when the wordpress team launches a new update we are standing by and we are the first to try it and adjust the theme if needed so you can always are up to date and use all the new features of wordpress from day 1. Walleto comes packed with a custom post type called “product” so you can make use of all the new WordPress features, and also to host your own blog inside the same website. So your normal wordpress blog posts are not disturbed by the theme and you have dedicated files for the product type, and for the new taxonomies. With our marketplace theme, your users can create their own shop, and start selling their own products. Walleto comes packed with a user account area, where your customers can track their orders, keep their products updated, add portfolio shop pictures, control finances, basically anything a modern ecommerce or marketplace website has. The admin area of Walleto offers you (as the admin) several tools to control every part of your website. Control the posted products, images, quantities, customer details, shop details, memberships, basically everything in your shop. Also you can control the colors of the website, with our color picker tool, and the total layout of your website. Your customers can add items/products to their shopping carts and purchase multiple products at a time. And they can even purchase multiple products at a time from multiple vendors in the same checkout order. After completing their shopping basket, they go to checkout and pay for their products. With Walleto theme your customers/users can exchange private messages, since our theme comes packed with a custom build private messages system. The buyers and sellers can communicate before the sale to ask more details about the products, or after the sale to set the shipping terms. Walleto comes with a complete e-wallet or virtual credits/cash system. Each user has his own e-wallet, where he can deposit real money. After the deposit, your customers can spend the money to pay for the bought items. Then at the end of the month the sellers can request payout of their balance after receiving payments for their sold products. Also this system can be turned on and off in case you dont want it. You can also make money with Walleto. Our theme has several monetization ways. The most important tool is the subscription based shop, where your users have to pay a monthly or yearly fee to have a shop on your website. Another tool is taking a percent out of each sale from your vendors/sellers. Other tools are: setting up adverts around the site and charging for different advert spaces, like header, footer, side, or front page. Walleto Theme is totally plug and play, meaning you only need to install the theme and you are ready to go. 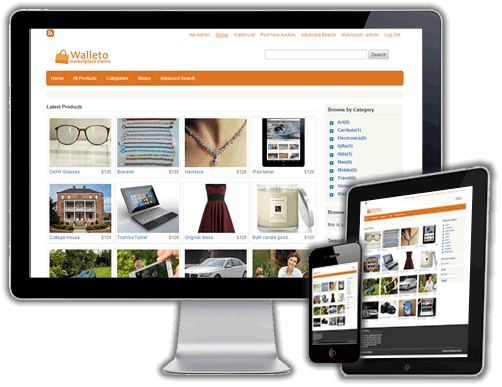 You can put online a marketplace website in minutes without any external piece of software. No external plugins needed, but of course the functionality can be enhanced if you use various plugins. The Walleto theme allows you to offer you customers to use their facebook accounts to login to your website, and shop as a regular registered user. You only need a free facebook application in your facebook account and you are ready to go. The Walleto theme allows you to offer you customers to use their twitter accounts to login to your website, and shop as a regular registered user. You only need a free twitter application in your facebook account and you are ready to go. Having several ways to pay is a very important thing in a marketplace or ecommerce website. The walleto theme offers many standard payment gateways: PayPal, PayPal Adaptive, Moneybookers/Skrill, Payza, iDeal. Other local payment gateways can be integrated on request. Contact us if you want other payment gateways integrated. All actions around the website are backed up by an email notification. Walleto theme comes with a complete admin panel where you can control, edit or translate any email notification message. There are notifications for registered users, posted product, order placed and many others.